Benchmark is another contender that provides a generous offering in its free e-mail marketing package. They stand out for their 24/7 customer support even for free users, along with dozens of short, helpful tutorial videos in their support database. Plus, if your native language isn’t English, Benchmark is one of the few e-mail marketing service providers that offers support for multiple languages, which at the moment includes Dutch, Polish, Turkish, and Swedish. Note, though, that if you’re only going for their free plan, it can be somewhat limited in a few critical features. Benchmark Email Marketing combines superb quality, user-friendliness and monitoring under one roof, giving you powerful features and tools for targeting the right audience. The user interface allows you to build high-quality templates and send professional looking emails, which you can then monitor as they land in peoples inbox’s. Support center with excellent resources on offer. Take a closer look at what Benchmark has to offer. Enjoy a 30-day free trial to explore more than 400 Benchmark’s elegant and smart templates on offer, before you commit to a plan. With such a variety of templates to choose from, you most likely will find the ones best suited to your marketing needs. However, if you chose the free for lifetime plan, be prepared to have the Benchmark logo on all of your sent emails. Template Selection: Benchmark offers over 400 template designs in a wide variety of themes and categories. If you have the skills, choose from one of the dozens of HTML templates and create an even more unique email template for your campaign. Customization: Benchmark’s template editor provides all the necessary tools to easily customize any template in matter of minutes. While Benchmark makes it easy to edit the templates, they do not offer multiple editing options. In the editor, you have to switch back and forth from preview to edit to get a better picture of how it will appear. Multimedia: A neat multimedia feature that Benchmark offers is being able to integrate your YouTube account to send video emails. Benchmark’s unique, multimedia templates offer a more comfortable way to watch the videos from email. Drag & Drop Editor allows you to move widgets and images into place like a puzzle, where all pieces fit! 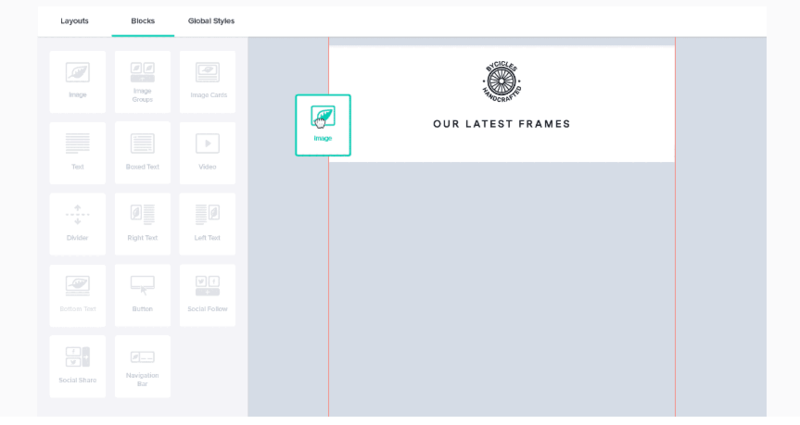 Live Editing allows you to edit your email template directly, get a glimpse of what it will look like using live preview, and update changes as you go along. Responsive emails, whether read on a desktop, tablet or smartphone, your attractive emails are dressed to impress! Photo Editing, if you don’t have Photoshop, don’t worry! You can edit your images directly in your email editor, where you may also add effects, messages, colors and fonts easily. Benchmark seems to get everything right. However, they tend to fall below the mark in terms of usability. The editor itself offers plenty of great features and tools available for the end-user, but can sometimes get cluttered up which results in confusion and aggravation. Also, we noticed that the preview section doesn’t provide a preview for how mobile visitors will see your email, they only provide a preview for the web. So you should double check on your mobile device, or use an online mobile test to make sure the emails you send are indeed responsive. Benchmark’s customer service will do everything in their power to give you the assistance you need. They’ve created dozens of short but helpful videos, with contact information at the end of each clip. Their customer support is unparalleled, and in our opinion, the best we’ve reviewed. A Variety of Plans to Get your Email Campaigns off the Ground! After you’ve enjoyed your free 30 day trial, Benchmark offers five pricing packages to choose from. We advise you pick a plan, depending on the number of subscribers you have. We tend to think the monthly Medium package is a good deal. It allows you to send unlimited emails each month to the list size you signed up for (from 600 up to 1,500 subscriber), while enjoying all the features on offer. Free For LifeTime – Is a great option for a startup business, who wish to test the waters of email marketing for the first time. However, this option does not specify the number of emails you can send per month. Nevertheless, it is risk free. As with many other free plans, this option limits your outgoing emails to subscribers who signed up through Benchmark’s signup form. Be aware you will not be able to import any contacts and that you will be limited to 10,000 emails a month. Medium Based – The Medium Based option offers different price ranges based on the number of targeted subscribers you signed up for. The Medium Based Plan best serves clients whose lists of subscribers range from 600 to 1,500. This plan allows you to launch multiple campaigns to your list and gives you access to all the basic features. If you need some guidance, you’ll enjoy full email and telephone support. Large Based – This plan targets users whose subscribers lists range from 55,000 to 65,000 and growing. All options offer unlimited numbers of outgoing emails. Their prices range from $286 to $360 per month. This plan will allow you to launch multiple campaigns to your lists and give you access to all features, including full support by phone or chat. Extra Large – Planning on sending over 100,000 emails a month? Benchmark will ensure your emails go straight to the inbox, plus you’ll have access to each and every feature and be able to manage sub-accounts. If you wish to switch to the free for lifetime option or simply stop sending emails at any time, there is no penalty fee, just make sure you do it before the end of the month. Massive Plan – targets businesses with an email turnover of over one million, at a cost of $4,500 to $5,000 per month. At the conclusion of our review, Benchmark proved high ranking in our books. While the Free for Life membership plan is limited on some critical features, it delivers an excellent email marketing service. In the past, there was no mobile app for Android, but to date Benchmark’s Email Designer can create responsive and mobile templates adaptable to any device. We recommend Benchmark for anyone looking to send professional quality emails.